WEBMASTER CONTACT INFORMATION - My wife and I moved from Maine to California to be nearer our grand children. With this move the only valid email for webmaster Larry Westin is westin@westin553.net - I have tried to change all earlier homepage contact information to show our current California contact info. There may still be areas on my Stinson homepage which continue to show our outdated Maine contact information, which is no longer valid. Our current contact information is Larry Westin, 21721 Verde St., Tehachapi, California 93561, phone (661) 823-4707. Larry Westin - "May I Always treat All others with Dignity and Respect." Susan Westin - "If you Fall Down 6 times, Get Up 7..."
IMPORTANT NOTICE - My Special Thanks to David Talley and Jack Harris who have for many years generously provided space on the Stinson Flyer server to store my Stinson data. Another really big contribution, David Talley provided a copy of the complete production list summary for every Stinson 108 built by Stinson! 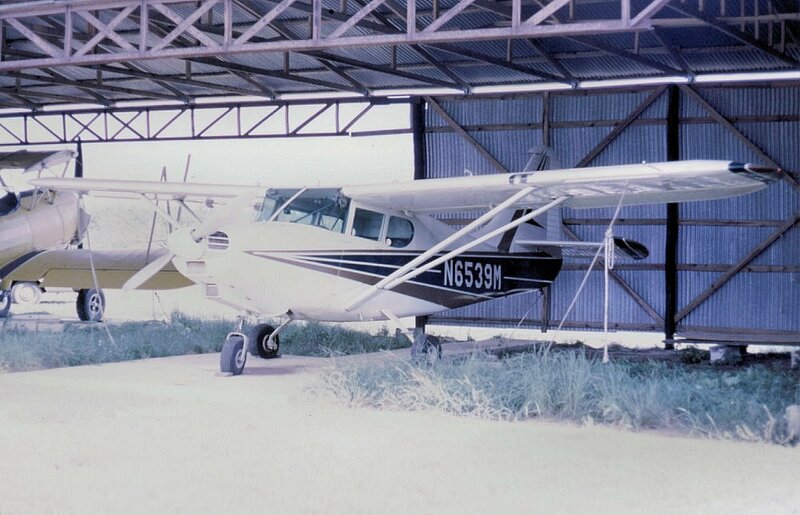 One early discovery - there was a Stinson 108-4 (serial number 108-4693)! I want to thank David for providing this valuable research information! Featured here is information and images about Stinson 108 series airplanes. Also included is information about earlier Stinson light aircraft; the model HW75, Model 105, Model 10/10A, O-49, YO-54, the model 76 L-5 Sentinel, and the L-13. Please take a look around. Classic General Aviation Aircraft 1940-1965 Photo Gallery "Period" photographs of general aviaiton aircraft built from about 1940 through about 1965. Most are photographs taken when the aircraft was new or shortly in service rather than museum examples or aircraft which have been restored. Added 01/09/02, Last updated 04/22/19. Propeller Driven Transport Aircraft Photo Page "Period" photographs of propeller driven aircraft. These are mostly photographs taken when the aircraft was new or shortly in service rather than museum examples or aircraft which have been restored. Added 04/25/99, Last updated 04/09/19. A really Unique "Twin Stinson". This article details a rather unique airplane built up from two others, a Stinson 108 and a Langley twin. The FAA lists this unique airplane as a "Pierce-Arrow" model U-2. Only one was ever converted. PDF, about 363K, now Rev. C, added 06/10/97, last updated 03/24/19. Ground view of the Pierce-Arrow model U-2, registration N6622A, serial number 1. The Pierce-Arrow model U2 is a one off airplane using the fuselage of a Stinson 108, and the wings of a Langley. You can view the Langley in original configuration at 1943 Langley Twin 2-4-90. My thanks to Mike Wilburn for the photo. Photo was taken in 1966, with 90 hp. Franklin engines. Person in the cockpit is John Pierce the guy that mated the Stinson fuselage to the Langley wings. Photo taken at the annual fly in at Fairfax Oklahoma. Later the Franklin engines were replaced by 125 HP Lycoming O-290D engines, and later yet with 150 HP Lycoming O-320 engines. B&W, about 138K, Added 03/24/19. A few times recently I've attempted to reply to e-mails only to receive back from the server messages such as "recepient not accepting mail from this user" or "user not on the accepted list." It is frustrating to try and reply to an e-mail only to have it returned by your "Spam" or "Junk" mail server filter. If you have your e-mail setup to block, please include my e-mail westin@westin553.net, as a valid recepient. Thank You - Larry Westin. Stinson108 Restoration Photo/Text Page This page shows in both photos and text the steps necessary to completely restore a Stinson 108. While the Stinson 108 is the subject aircraft, the process applies to almost all tube and fabric type light aircraft. Added 01/01/01, updated 03/14/14. This 3 view illustration shows a comparison between the Small Tail and Big Tail Stinson 108's. This 3 view drawing is found in "The Stinsons A pictorial history" by John Underwood. Used with permission. The small tail airplane is straight model 108 registered NC97205, the 205th Stinson 108 built. It carries the standard early straight model 108 paint scheme. The big tail airplane is NC501C, the 3501st Stinson 108 built. NC501C is the first model 108-3 built and is shown with the standard 108-3 paint scheme. The front and top views of this drawing apply to all Stinson model 108's. B&W, about 46K, Added 02/01/01. Stinson108 Voyager Photo Gallery Unique aircraft photographs, specializing in Stinson 108 Voyager series aircraft, also includes other Stinson "Light" aircraft, such as the Stinson model 10/10A Voyager including some views of the airplane used in the Civil Air Patrol (CAP) during WWII, O-49 Vigilant (Later the L-1), YO-54 Voyager, and L-5 Sentinel, Stinson Voyager 125 and the last aircraft designed by Stinson, the L-13. Added 10/01/94, Last updated 01/01/19. Stinson 108 Instrument Panel Page Shown are images of the Stinson 108 instrument panel as delivered from the factory, plus images of instrument panels installed in the field. Last updated 04/03/14. Stinson 108 Restoration Photo/Text Page This page shows in both photos and text the steps necessary to completely restore a Stinson 108. I want to thank David Talley for providing the disk space on the StinsonFlyer Homepage for me to add this information. While the Stinson 108 is the subject aircraft, the process applies to almost all tube and fabric type light aircraft. Added 01/01/01, Last updated 03/14/14. 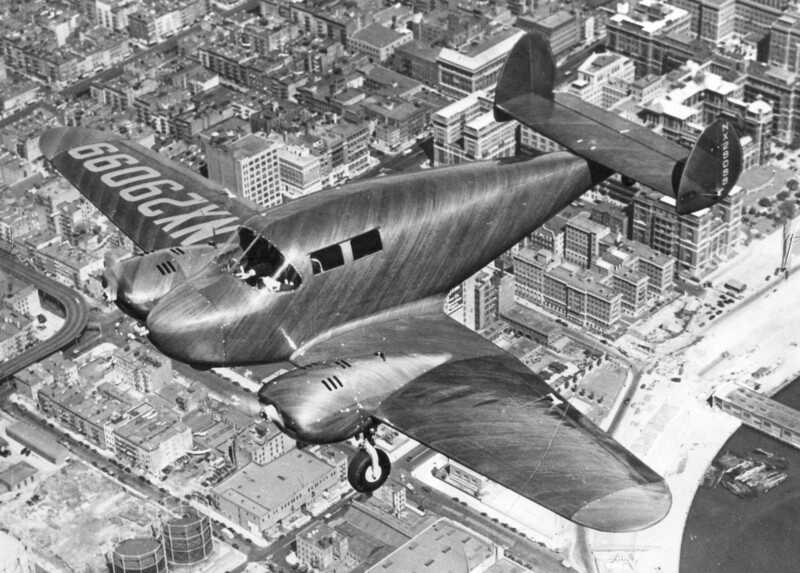 Before World War II Stinson built a line of Radial engine aircraft, both for personal use, and airline use. Here are image of the Stinson Radial Engine Airplanes. Includes photos of both the straight wing Stinson Reliant and Gull Wing Stinson Reliant. Last updated 10/17/10. 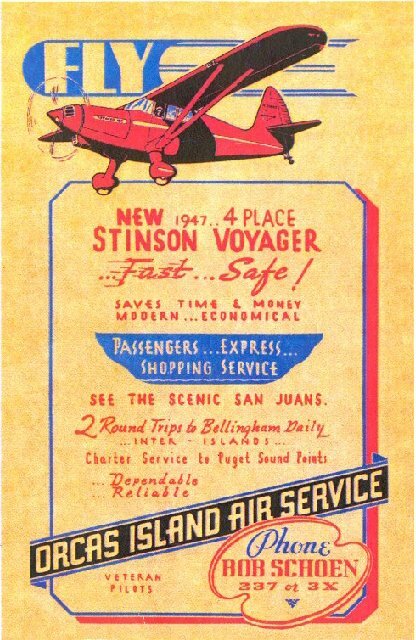 The Stinson 108 Voyager and Flying Station Wagon Advertisement Page "Period" advertisements about the Stinson 108. This area is a good place to find the original paint schemes and interior views. Added 04/25/99, Last updated 04/04/08. Photographs of Stinson Float Planes , shown here are both "period" factory photographs and also more recent photographs of Stinson float planes. Stinson 108's were offered with floats direct from the factory. Added 12/01/99, Last updated 10/10/14. Photographs and Information about Stinson 108 Ski Planes. Although I live in a northern area of the United States, I have never flown in ski equipped plane. I appreciate the input from others who have flown the Stinson 108 series airplanes on skis. Stinson 108's were offered with skis direct from the factory. Added 03/25/10, Last updated 03/27/10. Consolidated/Convair/General Dynamics Aircraft Aircraft Photo Page "Period" photographs of aircraft manufactured by Consolidated and predecessors. Stinson was a division of Consolidated Vultee Aircraft until sold to Piper in December 1948. These are mostly photographs taken when the aircraft was new or shortly in service rather than museum examples or aircraft which have been restored. Added 01/03/97, Last updated 02/06/19. John Baker's Homepage, Hangar 9 Aeroworks, has a lot of information on Stinson 108's. Particularly information about engine options for the Stinson 108 airplanes. There is also a great deal of information about Stinson empty weight data. Recommend you visit John Baker's Hangar 9 Aeroworks homepage. IMPORTANT UPDATE Due to health issues, John is selling the Stinson parts from his NC6197M project. Suggest you check out John Baker's Stinson Hangar Sale page, lots of first class Stinson parts. Added 12/30/98, updated 04/22/11. Stinson 108 Approved Type Certificate A-767 Type Certificate Data Sheets. I downloaded this copy, revision 28, from the FAA Homepage, it is in Adobe Acrobat (PDF) format. NOTE - Univair updated the type certificate to revision 28 on October 1, 2011. Added 3/6/98, last updated 10/26/11. Franklin Engine Type Certificate E-238. 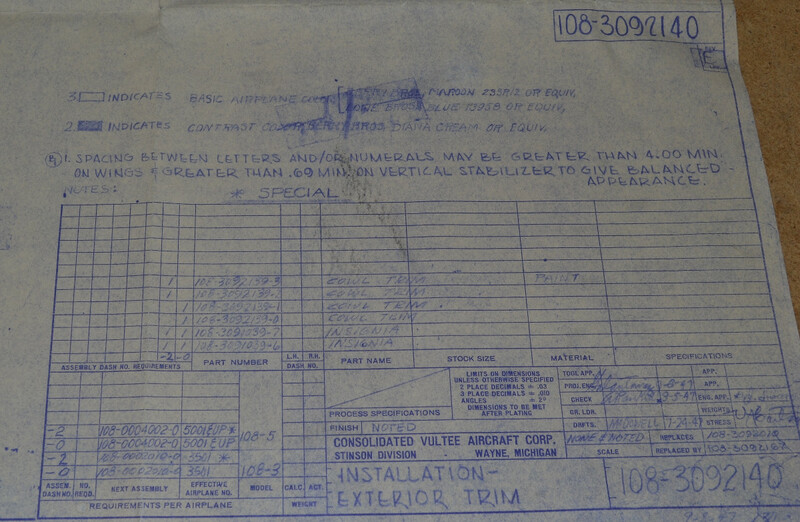 Type Certificate Data Sheet E-238 covers Franklin models 6A4-150-B3, 6A4-150-B31, and 6A4-165-B3 engines used in the Stinson 108 as delivered from the factory. This TCDS includes some other Franklin engine models which were not installed in Stinson aircraft. The rights to the Franklin engine, and the owner of the type certificate data sheet for these engines is "Franklin Sp. z.o.o." - located in Grudziadz, Poland. My thanks to Marc Huffnagle for letting me know this type certificate was updated, now E-238 is at revision 14. About 66K, Adobe Acrobat (PDF) format. Added 09/07/04, updated 09/15/13. 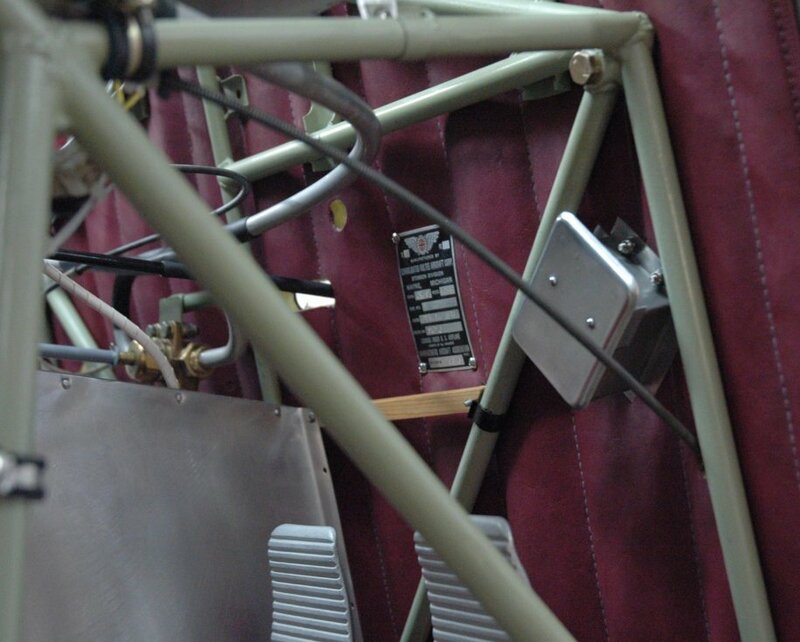 This image shows the proper location of the Stinson 108 series Aircraft Data Plate which is inside the cabin, above the co-pilot's rudder peddals. My thanks to John Baker for providing this image. Color, about 101K. NOTE this data plate must be in the airplane. New regulations require an external data plate near the tail. At this time both are required. The data plate near the tail is a recent addition and comes in many styles. Added 09/01/11. Stinson 108 STC's, a list of Supplemental Type Certificate changes FAA approved for all Stinson model 108's. NOTE this is NOT an official list. It is presented in an easy to view format showing STC number, description, date of last FAA action, and which Stinson model 108 the STC is approved for. Provides instructions on how to access the FAA STC database online. PDF format, Rev. K, about 41K, added 06/11/96, last updated 11/25/14. The FAA now has an online homepage where Supplemental Type Certificates. Take a look at the FAA's Supplemental Type Certificate Page. To view Stinson 108 STC's you need to first select "By Make," then the letter "U," then expand "Univair Aircraft Corporation." Univair is the type certificate holder for the Stinson 108 series. Then select which model Stinson 108 you are looking for, plus you will also need to view "108 Series" as well. Added 09/02/02, updated 04/07/13. Stinson AD's An overview list of Airworthiness Directives for the Stinson model 108, the Franklin 6A4-150 and 6A4-165 engines, the Koppers "Aeromatic", McCauley and Sensenitch Propellers, and the Marvel-Schedler carburetor. NOTE this is NOT an official AD list, it is provided for Stinson owners information. Rev C, PDF, about 170K, added 04/09/96, last updated 11/23/17. Copies of FAA Published AD's for the Stinson airplane, Franklin engine, and other equipment which may be installed in a Stinon. The AD list gives an overview of the Airworthiness Directives issue by the FAA for the Stinaon airplane, Franklin engine and other equipment which may be installed in a Stinson. This page gives the full Airworthiness Directive as published by the FAA. Each AD is it's own PDF file. Page created 11/30/17, last updated 12/01/17. The FAA no longer sends paper copies of Airworthiness Directives, you can find AD's online. View the FAA AD information at FAA's Airworthiness Directive Page. To view Stinson 108 AD's you need to first select "By Make," then the letter "U," then expand "Univair Aircraft Corporation." Univair is the type certificate holder for the Stinson 108 series. Then select which model Stinson 108 Airworthiness Directives you are searching for. Added 04/07/13. The FAA now has a homepage to request copies of Aircraft Records either on CD-ROM or Paper. The FAA will send you the records and include with the records a bill for the material. Cost is very reasonable. When requesting aircraft records be certain to advise in your request if the aircraft is currently, or is not currently on the FAA registery. Just because an airplane has a "N" number painted on the airplane does not mean it is current on the FAA register. Last updated 04/21/14. FAA Warning - Shop Performing Illegal Franklin Engine Repair. A company doing business as the Franklin Engine Club, from Underwood, Indiana, has performed substandard, illegal maintenance on Franklin engines. PDF, added 04/12/96, last updated 11/18/14. The Stinson airplane flight manual is a required document which must be in the airplane during flight. Each airplane has an unique airplane flight manual because of model, and also because the equipment list is in this manual, not the "Owner's Operating Manual." Here is the basic Stinson 108-3 Airplane Flight Manual. Radios and other equipment would be added to the equipment list for each airplane. In addition to the Airplane Flight Manual each airplane was delivered with a weight and balance page. File is in PDF format, about 789K. Added 08/14/12. Each airplane has two documents which are unique to each individual airplane, the equipment list and the weight and balance. 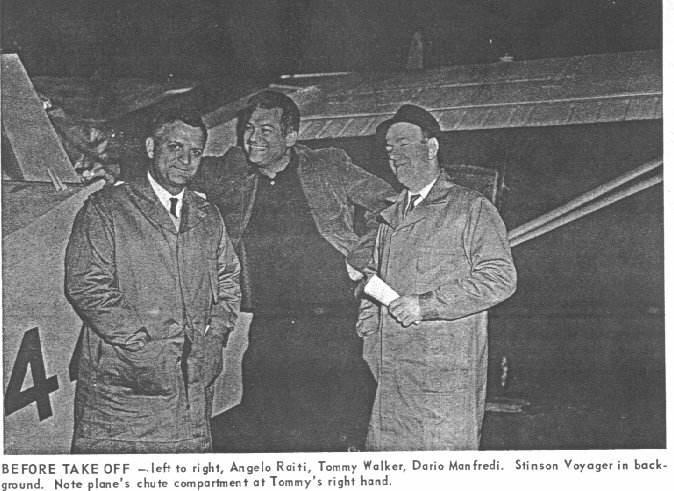 Stinson delievered each airplane with an Equipment List included in the airplane flight manual. NOTE the airplane flight manual is not the pilot operating handbook. The flight manual is a separate 4 pages unique to each airplane. This is an actual flight manual for a Stinson 108-3 with the equipment list shown on page 4. Stinson listed all optional equipment and "X'ed" out equipment items NOT installed. PDF format, about 416K. With the equipment list created then the airplane was weighed. Here is a sample of a Stinson Weight and Balance measurement. This weight and balance is for the same airplane as flight manual equipment list. When this weight and balance was performed there was oil in the engine of 17 pounds which is not part of the empty weight, and there was no fuel in the tanks of which the unusable fuel of 4 gallons, 24 pounds, is part of the empty weight. So the weight as weighed is 1,308 pounds, minus 17 pounds for oil, and plus 24 pounds for unusable fuel, giving an actual airplane empty weight of 1,315 pounds. In addition to the weight, the report also provides the moment so weight and balance can be calculated with people, fuel, oil, and optional equipment added. PDF format, about 167K. Added 09/01/17. 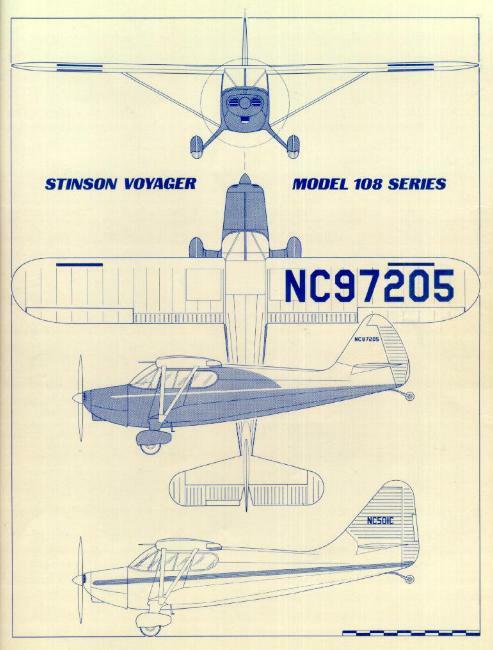 Stinson published information about the Stinson 108, including Service Bulletins, Service Letters, and Parts and Accessories Letters. Click here to view Stinson 108 Service Bulletins and Service Letters numbers 228 through 267, including Piper Service Bulletins 114 and 115, Piper Service Letters 164, 208, and announcement of sale to Vest Aircraft, which is now Univair, plus Univair Stinson Service Letter 81. Added 06/03/09, updated 12/09/13. Stinson also published information about the Stinson 108 which is informative, rather than of an airworthy nature using a different type of letter format. Click here to view the Stinson 108 Service Parts and Accessories Letters. Exammples of what these letters provide include information such as original paint colors from the factory, how to purchase parts for the Stinson 108 not available from Stinson, such as Koppers Aeromatic propeller spinners, stretchers, etc. from other companies, part numbers for adding tie down rings, installing an external baggage compartment door for those airplanes delivered before the external baggage compartment door was standard, and other information. Often these letters contained Stinson part numbers for items manufactured after the basic parts manual was published. Added 02/16/16, last updated 02/18/16. Stinson Wiring Diagrams - unlike many light aircraft built in the 1940's, all Stinson model 108 airplanes came from the factory with a 12 volt electrical system, including battery, engine driven generator and voltage regulator. Click here for a copy of the airplane electrical wiring diagram for the model 108, 108-1 and 108-2 airplanes. Adobe PDF format, about 42K in size. Click here for a copy of the airplane electrical wiring diagram for the model 108-3 airplanes. Adobe PDF format, about 40K in size. Added 11/06/15. Stinson Electrical Considerations - some Stinson 108's came from the factory with a 15 amp generator, most model Stinsoncame from the factory with a 25 amp generator. Click here for considerations for changing or adding electrical devices or avionics in a Stinson 108's. Adobe PDF format, about 28K in size. Added 05/01/16. Stinson 108's and 108-1's were delivered with the Franklin 6A4-150-B3 150 HP engine, while the Stinson 108-2's and 1083's were delivered with the Franklin 6A4-165-B3 165 HP engine. Air Cooled Motors Franklin engines were supported by factory Franklin Service Bulletins, Service News and Service Letters, Service Information and Overhaul Information. Here you will find supporting documentation for the current TBO of 1,200 hours, using aviation gasoline with lead, etc. Added 07/28/09, updated 08/31/12. Click here for a PDF copy of the Franklin Service Manual for the 6A4-150-B3 and 6A4-165-B3 engines. About 5.2 meg. Parts list for the Franklin 6A4-150 engine. PDF format, about 2.3 meg. NOTE these are large files, recommend a high speed connection to download. Univair, homepage www.univairparts.com, has quality reprints of these Franklin manuals, as well as most Stinson manuals. Added 09/24/11. Annual and 100 hour inspections are very important. At the time Stinson model 108's were built the basic starting point for these inspections was the CAA Form ACA-319 checklist. This is a JPG image which you can print, about 165K in size. Stinson includes additional important points to check for the Stinson 108 models in the General Service Manual Chapter XI - Service Inspection. Chapter XI also includes preflight, daily, weekly or 25 hour points to check in addition to the 100 hour Annual inspections. File is in Adobe PDF format, about 796K in size. Added 04/01/11. Charlies Wirt, Stinson A&P mechanic with Inspection Authorization, sent these forms to help with your annual or 100 hour inspection. Start with the Pre Inspection and Run Up Check form. Completing this data gives the mechanic a good indication of the condition of the airplane as it enters the shop for service, PDF format, about 437K. Next the mechanic completes an Aircraft Equipment List. 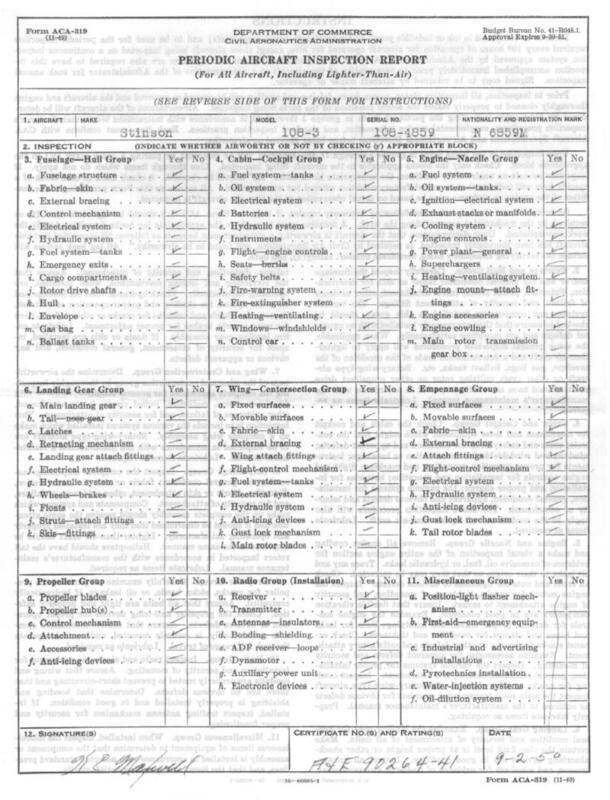 The equipment list is used by the mechanic to create a list of items to check against Airworthiness Directives, PDF format, about 473K. With the preliminary work done, the mechanic uses a detailed Aircraft Inspection Report to avoid missing points during the inspection, PDF format, about 845K. My Thanks to Charlies Wirt for sending these sample forms. Added 04/22/11. Listed here are both required and available Stinson 108 Documentation and Manuals. Take a look to verify you have the needed documentation and manuals to support safe and legal flying. Includes information about the Stinson Data Kit. Now includes Univair part numbers for the Stinson Circlular Slide Rule and the instructions for the slide rule (as I write this the cost is less than $11.00 for both the Stinson CircularSlide Rule and the Instructions for its use)!! Last updated 12/30/01. When Stinson delivered a new 1948 108-3 a "Stinson Data Kit" was included for the new owner. 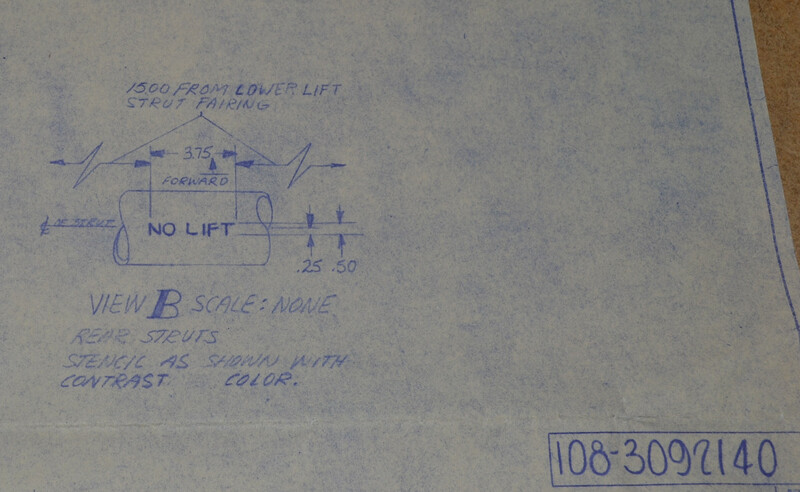 Among other items, Stinson included a 5 x 8 inch laminated checklist for the 108-3. Image 108cl-1.gif is one side of the Stinson 108-3 checklist, image 108cl-2.gif is the other side of the Stinson 108-3 checklist. Last updated 01/02/02. Correct weight and balance of any airplane is essential for safe flight. Homepage visitor Tim Briggs sent me three Microsoft Excel 97 spreadsheet files. These Excel files are configured so you can calculate Stinson weight and Balance. Three spreadsheets are available. First spreadsheet is stn108.xls , 128K, is for the straight model 108, the second spreadsheet is stn108-2.xls , 126K, is for the Stinson 108-1 and 108-2. The third spreadsheet is stn108-3.xls , 127K, is for the Stinson 108-3. NOTE - MS Excel files are not normally displayed, so when you click on these links you will be asked if you want to download or open them. I suggest you download the files to your P.C., then later open Excel and view them. If you have questions or comments please e-mail Tim Briggs at tbriggs3@mn.rr.com. Last updated 11/23/05. Here is a Main Differences Chart of the various Stinson 108 models. Adobe Acrobat Reader PDF format, about 11K, added 03/01/13, updated 01/01/14. Differences between the Voyager model and The Flying Station Wagon model. Lists of the differences between the Stinson model 108 Voyager and the Stinson model 108 Flying Station Wagon. Includes the inside cabin dimentsions and baggage door dimensions of the Stinson 108. PDF, Rev. D, added 11/25/96, last updated 11/18/14. The Stinson 108 Rear Baggage Compartment and External Baggage Door for the various Stinson model 108 production aircraft. Adobe Acrobat Reader PDF format, about 8K. Added 01/01/14. How to determine visually if the Stinson has a Light or Heavy Case Franklin 6A4-165-B3 Engine. Franklin engines serial number 33045 and earlier came from the Aircooled Motors factory with a "light" case. Today many Stinsons which came with the light case are advertised for sale as having a "heavy" case. This article explains how to quickly check with a visual inspection whether the engine has a light or heavy case. Adobe Acrobat Reader PDF format, about 12K. Added 05/29/13. When buying a Stinson 108 there are some areas which need careful examination. This article explains some the Important areas to check when buying a Stinson model 108 airplane. This article deals with the Stinson 108 specifically, so many areas which are applicable to the purchase of any airplane must also be followed. PDF, about 19K, Rev. 3, added 07/16/05, Last updated 10/17/14. Stinson Model 108 Serial Numbers This article describes where the Stinson 108 serial numbers are located in the airplane. PDF, about 9K, Rev. 1, added 02/03/07, last updated 10/17/14. Stinson and Franklin Parts and Service Sources. If you know of sources which I have not listed, or errors with the list, please send me your updated information. Please continue to provide corrections and updates! PDF, about 35K, Rev 118, added 04/12/96. Last Updated 10/17/14. Due to health issues, John Baker is selling the Stinson parts from his NC6197M project. Suggest you check out John Baker's Stinson Hangar Sale page, lots of first class Stinson parts. Last Updated 10/13/13. Stinson 108 Parts and Service Recommendations by Joe Dexter. Joe Dexter is the Technical Editor for the International Stinson Club, see his article appears each month in the "Skywriter." You can reach Joe at joedexter@earthlink.net. Converted Joe Dexter's Parts and Service Recommendations to PDF format on 11/19/14. Added 11/2/98. Stinson's for Rent and or FBO's who have a Stinson 108 for rent, or provide Stinson 108 flight instruction. PDF format, about 22K, now Rev. T, added 09/07/97, Last Updated 12/13/17. New and Remanufactured Parts for the Stinson 108 Voyager and Flying Station Wagon. This list is of individuals and companies who build new parts for the Stinson. Included are original type -3 wooden side panels, refinished control wheels, and etched instrument panels. If you want your Stinson to look original please take a look here. Last updated 06/02/11. Stinson Propeller Service available. Kent Tarvers is the owner of Aeromatic, Flottorp and formerly Beech Roby propellers, along with 13 TC's on props. Kent Tarver can be reached at his homepage, TARVER PROPELLERS, LLC. Although he reports a big backlog he may be able to help you with your propeller problems. Added 05/17/02. Stinson Clubs listing of clubs which support the Stinson airplane. 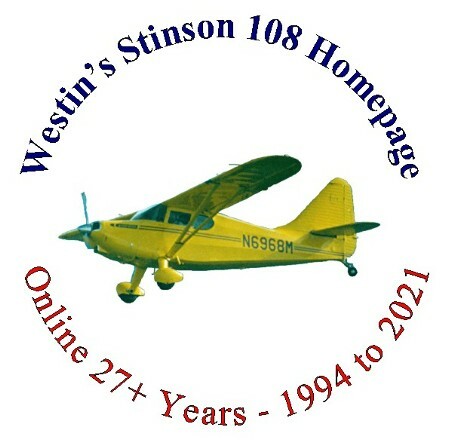 Consider joining a Stinson club for more information about this great airplane. Rev. 13, PDF about 12K, added 04/14/96, last updated 10/18/14. Also check for Stinson 108 STC's under FAA Data & Info for FAA approved changes which have multiple Supplemental Type Certificate design change modification approval. Stinson 108 13 Gallon Auxiliary Fuel Tank. Many year ago Met-Co-Aire built a 13 gallon auxiliary fuel tank for the Stinson 108. 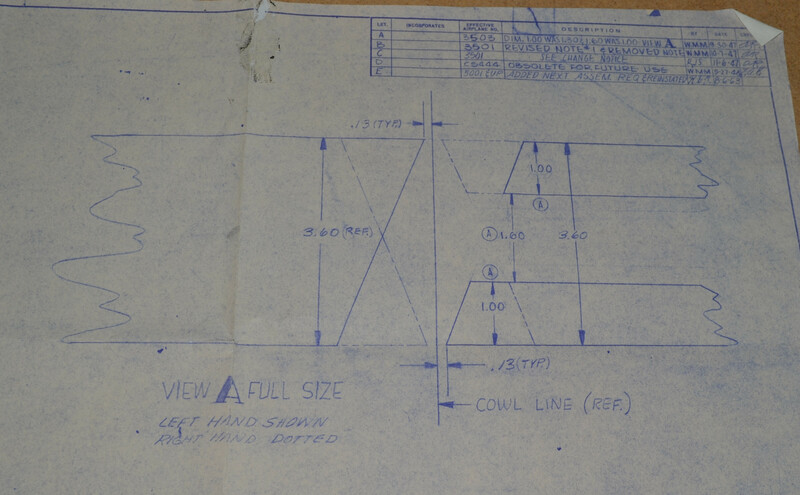 While Met-Co-Aire no longer builds the tank, learn how you can obtain the drawings needed to construct a tank yourself. 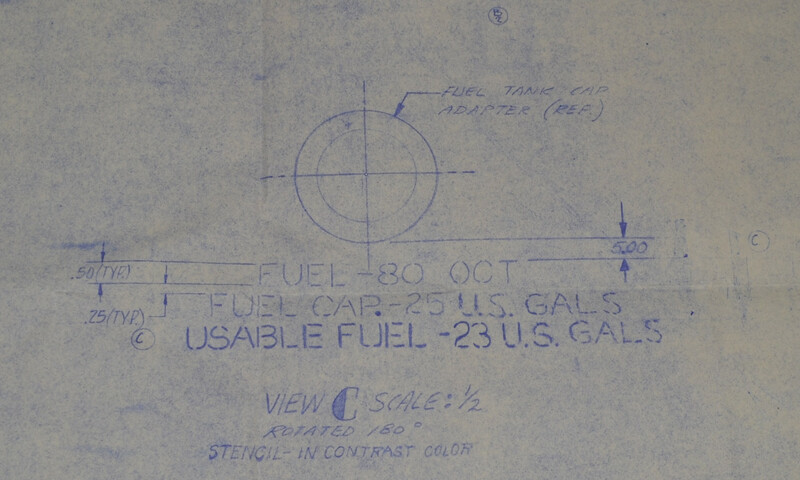 My thanks to David Bogart for researching the auxiliary fuel tank. You can visit the Met-Co-Aire homepage for detailed contact information. PDF, about 8K, Rev. B, added 07/25/04, last updated 11/01/14. At least two different Stinson 108's have been modified with tri-cycle landing gear. Robert Brackenhoff sent me this image of n6539m-1.jpg on tri-cycle landing gear. Believe this change is approved on STC SA327SO. An additional part of this STC is to change the engine to a Lycoming O-435 with controllable propeller. Color, about 126K, added 06/21/09. Here is a second image of Stinson N6539M showing a side view. Photo taken about 1973. My thanks to Friedrich Huggler for sending this image. B&W, about 89K, added 03/21/15. 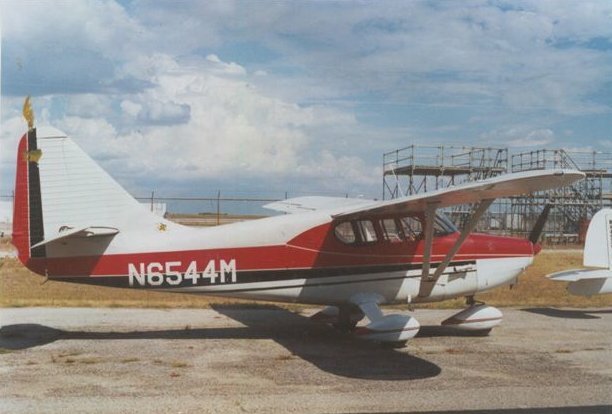 Russell Chambers of Texas has modified N6544M to tri-gear configuration. Take a look at n6544m-1.jpg and n6544m-2.jpg for images of Chambers's tri-cycle Stinson 108-3. 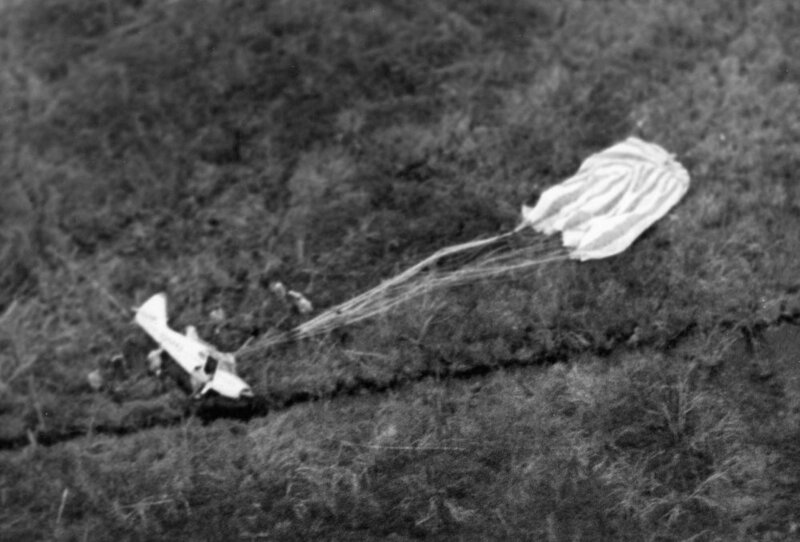 Chambers indicates the landing gear has been modified since these photos were taken. 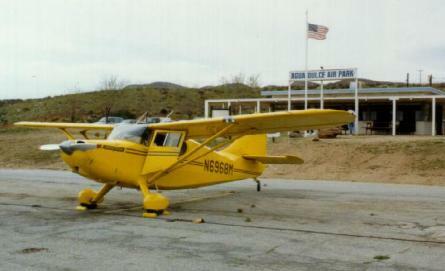 Russ Chambers sent me an updated image of n6544m-3.jpg taken in late 2004. You can learn more about the Russell Chambers tri-gear modification via email at russchambers@geusnet.net. Updated 11/28/04. Stinson 108-2 equipped with huge Goodyear Terra Tires for soft field operations. Terra Tires are shown installed on Stinson 108-2 s/n 108-2370, N9370K. These tires are much larger than regular aircraft tires and require a much modified landing gear. Goodyear made these tires with very pliable walls using a tire pressure in the 3 to 8 pounds per inch range enables the tires to use uneven surfaces, even plowed fields. B&W, about 307K, added 07/19/16. Light Stinson's BEFORE the model 108. This article is an overview of the three "light" aircraft built by Stinson before the model 108 Voyager. These aircraft include the Stinson 105 (HW75/80), the model 74 USAAF O-49 (later L-1), Voyager model 10/10A and the model 76 L-5 Sentinel. PDF, Rev. B, added 01/07/96, updated 11/18/14. Stinson L-5 Sentinel Information. Detailed information about the Stinson model 76 USAAF L-5 Sentinel, also known as the "Flying Jeep" series of aircraft. PDF, about 45K, revision 12, added 02/17/96, Last updated 04/24/16. Prototype Stinson model 108 details. 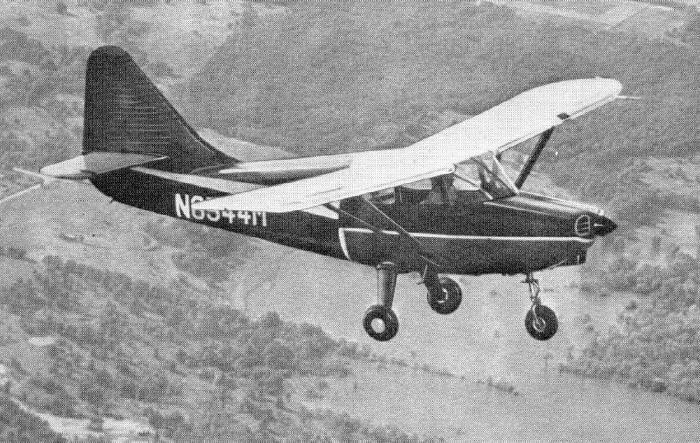 This article details how Stinson used two model 10A Voyagers and converted them into the prototypes Stinson 108's. Originally in ASCII text format, now in Adobe Acrobat PDF format. Rev. B, about 14K. Added 12/01/97, updated 10/03/14. Stinson 108 Identification. 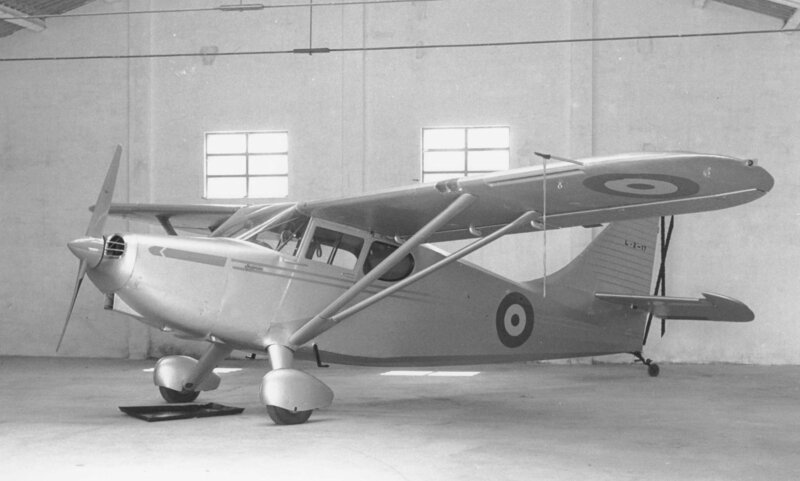 This article includes serial number ranges, FAA STC 767 information, U.S. registration numbers from the factory, Vertical Stabilizer and Rudder Differences and Misinformation, and the External Baggage compartment door as delivered from the factory for the six different Stinson model 108's built. Now Rev. K, Adobe Acrobat PDF format about 19K, added 01/28/96, last Updated 10/05/14. Stinson Model 108 Series This article is an overview of the six models which make up the Stinson 108 series, 108, 108-1, 108-2, 108-3, 108-4 and 108-5. Rev. F, PDF, about 29K, added 01/17/96, last updated 09/03/14. From the Stinson Dealer Sales guide the list of Stinson model 108-3 Standard Equipment, and 108-3 Optional Equipment. The Safe Flight stall warning sensor became optionally available from the factory at 108-3 serial number 108-4200. Adobe Acrobat PDF format, about 183K, added 06/05/16. From the Stinson Dealer Sales guide gives the percentage of Voyager versus Flying Station Wagon configuration. Letter is dated December 4, 1947, bulletin number 40. The change in percentage between the Voyager and the Flying Station Wagon being effective April 1948. Adobe Acrobat PDF format, about 154K, added 06/05/16. From the Stinson Dealer Sales guide gives the 1948 Voyager and Flying Station Wagon 108-3 performance data comparing the standard wood propeller which is the Sensenich 76JA-53 or 76JR-53 that weights 14 pounds, with the "special equipment propeller" which is the metal McCauley 1A170 DM7453 that weights 33 poungs. So improvements in take off distance, rate of climb and cruise speed, with the metal McCauley propeller causes a reduction in useful load of about 19 pounds. Adobe Acrobat PDF format, about 76K, added 07/01/16. From the Stinson Dealer Sales guide gives the 1948 Voyager and Flying Station Wagon 108-3 factory weights for different configurations. This chart compares the standard airplane, the Voyager, with the Stinson Flying Station Wagon, in different landplane and seaplane configurations. From the factory the useful load ranged from 1009 to 1106 pounds with standard equipment. There are 26 pounds of additional weight in the Flying Station Wagon because of the reinforced floor under the rear seats, and the additional weight of the wood panels in the back seat area. All of the weights shown are shown with the standard wood propeller in both landplane and seaplane configurations. The standard wood propeller is the Sensenich 76JA-53 or 76JR-53 which weights 14 pounds. If the "optional special equipment propller," the metal McCauley 1A170 DM7453, is installed it weights 33 pounds which reduces useful load by 19 pounds in each case. Adobe Acrobat PDF format, about 164K, added 07/01/16. Stinson changed to installing only the Ski axel on the 1948 Voyager and Flying Station Wagon 108-3 at serial number 108-4125. Stinson serial numbers 108-1 to 108-4124 came standard with the land plane axel, Stinson part number 108-5111004. If the owner wanted to use skis they had to change the axel to Stinson part number 108-5611001. From serial number 108-4125 on only the ski axel was installed and could be used either as a landplane, or a ski plane. Adobe Acrobat PDF format, about 136K. added 07/10/16. All the original documentation I have for the Stinson 108 shows a Wayne, Michigan, address. Click here to learn where the Stinson 108 was actually built!. PDF, about 9K, Rev. B, added 11/28/04, last updated 11/01/14. One of the buildings used by Stinson still exists on what was originally Detroit Wayne Industrial Airport, later Stinson field. Here is an image of Ron Piskor's Stinson 108 RC model in front of the former Stinson hangar. Image was taken April 30, 2017. My thanks to Ron Piskor for sending me this image of his 1/20th scale Stinson 108 RC model in front of the old Stinson hangar. Color, about 210K. added 05/05/17. 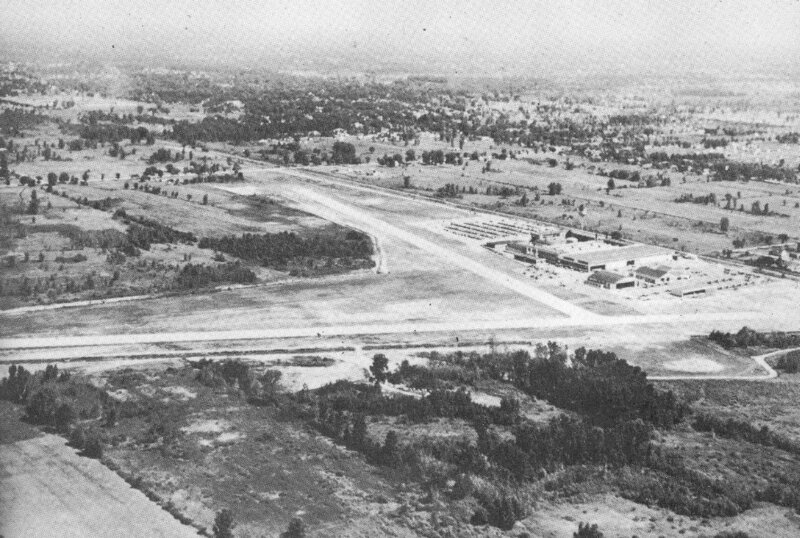 Here is an aerial view of the Detroit Wayne Industrial Airport circa 1946. Wayne Michigan is at the top right of this image. This is a big image, B&W, about 275K. 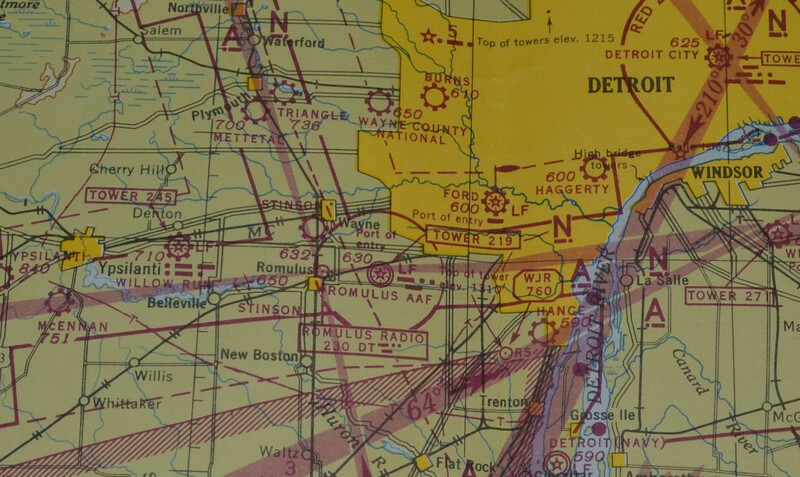 Here is an image of the Detroit Sectional Chart for 1943, Stinson field, is just south and a little west of Wayne, MI. What is shown as Romulus Army Air Forces (AAF) is now called Detroit Metropolitan Wayne County Airport. Color, about 305K. 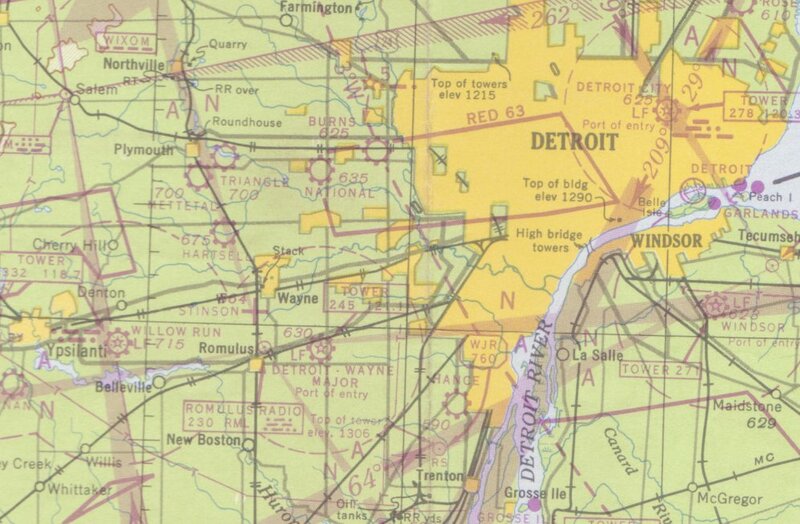 Here is an image of the Detroit Sectional Chart for 1948, look for Stinson field, just south and a little west of Wayne, MI, color, about 149K. Added 11/28/04, last updated 08/05/17. All general Aviation sales for 1947 in units and dollar value. After WWII general aviation sales were brisk until the second half of 1947 when sales plumented. This sheet shows first half, second half, and total dollar amount for 1947. Data shows that Stinson had the highest dollar sales for all of 1947. Data includes 16 manufactures. PDF format, about 157K, added 11/11/12. Stinson 108 Factory Delivered Costs This article shows the factory delivered costs for new Stinson 108 models. Originally in ASCII text format, now in Adobe Acrobat PDF format. Rev. B, about 8K. Added 10/06/05, updated 10/03/14. Stinson 108 Factory Delivered Paint Colors, for all model 108 serial numbers based on the Production Record. The base information for this color PDF file comes from the SERVICE PARTS and ACCESSORIES LETTER number 1-D, dated April 2, 1948. This letter shows the standard factory paint colors for each serial number model 108, 108-1 and 108-2. It shows only the colors for the 108-3 but not which serial number is which color. 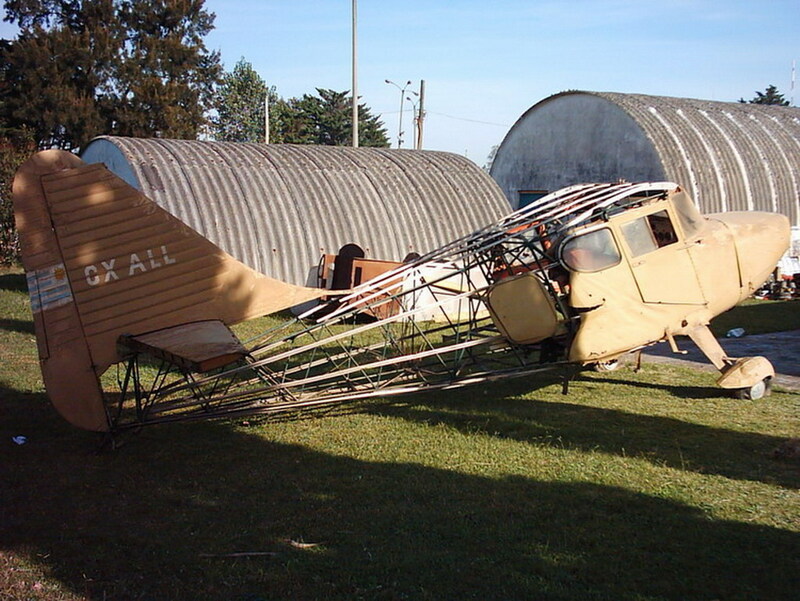 Many Stinson 108's were delivered in a non standard paint scheme, such as in primer only. This letter does not show those non standard paint from the factory, only the Stinson Production Record has each 108-3 serial number to color, or does it show those airplanes with non standard paint. Paint color PDF file is Rev. S, PDF about 13K, 02/25/96, last updated 02/16/16. 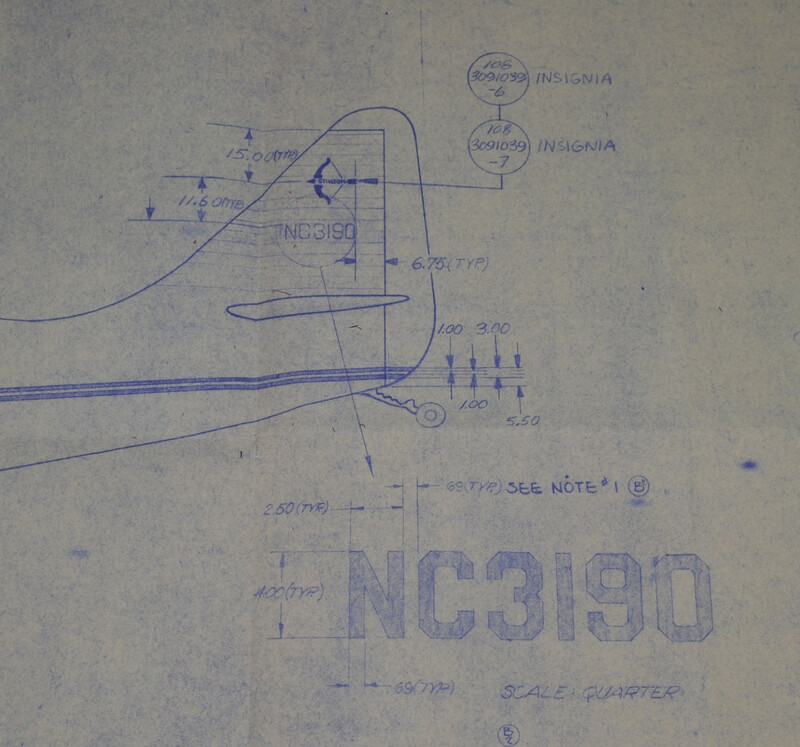 Stinson specification drawing 108-3092140 defines how the standard Stinson Paint Trim was applied to the model 108-3. The drawing is too large to present as a single image. Too allow an ability to read what is on the drawing I present the drawing in seven sections in JPG format. First is part 1 - the drawing data block, about 313K. Second is part 2 - fuselage overview. Note the location in the overview of detail section A and section B, details for these parts below. About 873K. Third is part 3 - section A detail. Note the stripe angle is different between left and right sides of the airplane. About 1.1M. Fourth is part 4 - section B detail, the "NO LIFT" lettering on the rear lift strut. About 226K. 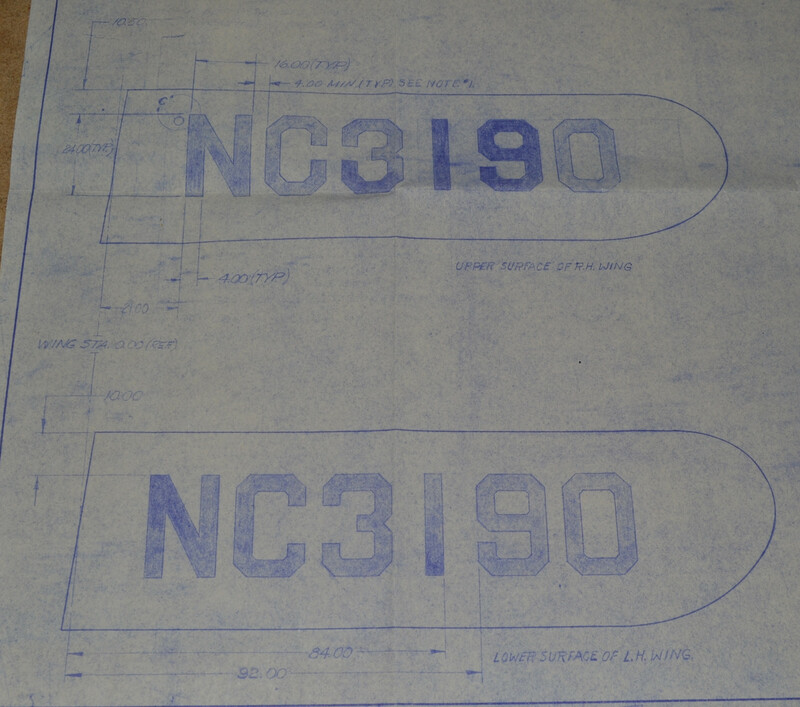 Fifth is part 5 - location of the 24 inch "NC" numbers on the wings. Note where detail section C is shown on right wing. About 498K. Sixth is part 6 - tail trim detail. About 403K. Seventh is part 7 - section C detail marking the fuel tank fillers. About 268K. Added 08/05/17. Stinson tests with NX8563K - Stinson tested this 108 with a single strut and other modification. 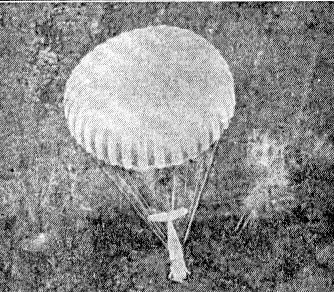 A photo of this specific Stinson is shown in "The Stinsons" by John Underwood. Adobe Acrobat Reader PDF format, Rev. C, about 10K, originally added 03/09/96, Added 09/03/14. Stinson Model 108-4 Flying Station Wagon describes the last model 108 designed by Stinson. 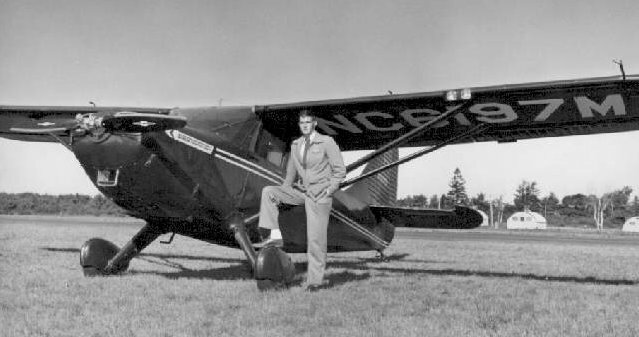 The model 108-4, serial number 108-4693, NX149C, was flown by Stinson beginning in April 1948, and later by Piper into late 1949. Various engines were flown on this airplane. Rev. C, PDF, about 10K, added 12/22/02, last updated 09/23/14. Stinson 108 Bibliography Printed information directly concerning the Stinson 108 series aircraft and the Franklin engine which powers the airplane. Details on John Swick's new two volume history of the Stinson 108. Cost is $26.95 plus $4 shipping for either volume, or you may purchase both volumes for $50 including shipping direct from thet publisher, Wind Canyon Books, Golden Age of Aviation Series. Or telephone 1-800-952-7007 Rev. 31, PDF, about 34K, added 01/28/96, last updated 09/26/14. Stinson 108's with Duplicate Serial Numbers. On 3 different occassions one serial number has been issued to two different Stinson 108 airplanes. Interestingly each pair of airplanes was flying at the same time! Now Rev B, Adobe Acrobat PDF format, about 9K, added 08/01/98, Last updated 10/05/14. Details about the Standard Stinson 108 Radios installed at the factory on all new production 108's. These radios are a far cry from modern synthesized VHF radios of today! Now Rev. C Adobe Acrobat PDF format, about 127K, added 06/28/98, Last updated 07/10/16. Here are individual images of the radio equipment. 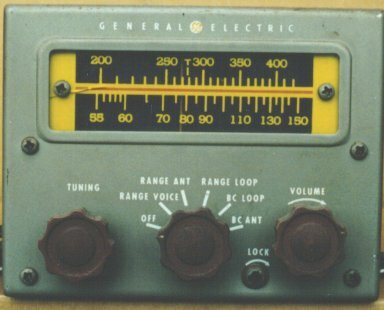 First is the General Electric AS-1B Radio used in the Stinson 108. 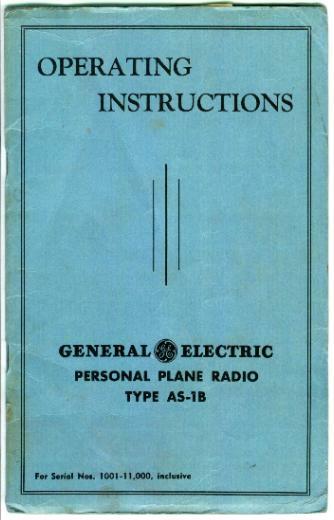 Here the Manual for the GE AS-1B. Next is the Halicrafters CA2 Radio used in the Stinson 108-1, 108-2 and 108-3. Here is the Manual for the Halicrafters CA2. Here is a view of a Hallicrafters CA-2 Skyfone installed in a Stinson 108-2, N9429K, in the original pilot position, still in place, but looking a little worn, late 2004. My thanks to David Martin for sending me the image of the CA-2 radio still installed in 108-2 N9429K. All Stinson model 108s were delivered from the factory with a direction finding capability. Keep in mind this was before the days of VORs, LORAN or GPS. Shown here is the fixed loop antenna installed inside the fuselage (this antenna worked because all factory delivered Stinson 108s were fabric covered). Added 1/27/01, Last updated 11/28/04. All Stinson 108's came from the factory with a two way radio, which had to be licensed as an aircraft radio station with the FCC (Federal Communications Commission), not the CAA (Civil Aeronautics Authority, now the Federal Aviation Administration). To obtain the aircraft radio station license circa 1948 the aircraft owner was required to provide the radio specifications to the FCC. Stinson provided radio specifications to apply for a aircraft radio station license. 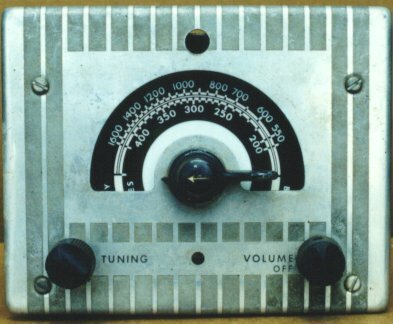 The frequency shown, 3105 Kc was later changed by the FCC to 3023.5 Kc on March 15, 1953. Adobe Acrobat PDF format, about 165K. added 07/10/16. Stinson 108's in Military service. Read about Stinson 108 as used by the Ejercito del Aire (Spanish Air Force) and the French Air Force. 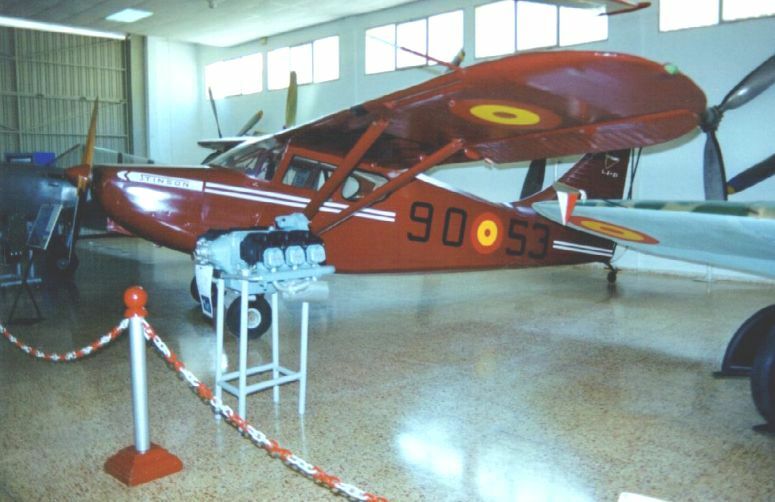 Spain used the Stinson 108 for liaison from the late 1940's through 1965. The French AF used the Stinson 108 in Indo China (Vietnam). PDF, about 13K, added 11/01/99, last updated 11/01/14. Here is an image of Ejercito del Aire L.2-17 in Service. Image courtesy of noted author John Wegg, black and white, about 152K. I visited the museum in September 1999 and again in April 2001. The Museo del Aire has 2 examples of Ejercito del Aire Stinson 108's on display. First is an unique example displayed uncovered in hangar 2. 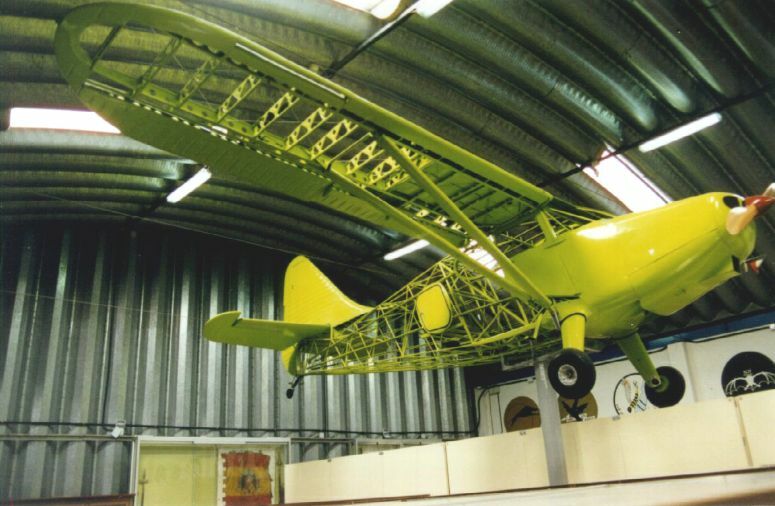 This airplane is displayed suspended from the ceiling, visitors can readily see the structure of the airplane. In another hangar is a restored example, shown here from the front and another view shown from the rear. These images added 11/2/99, Jaime Cervera sent me this information about the Stinson 108's used in Spain. 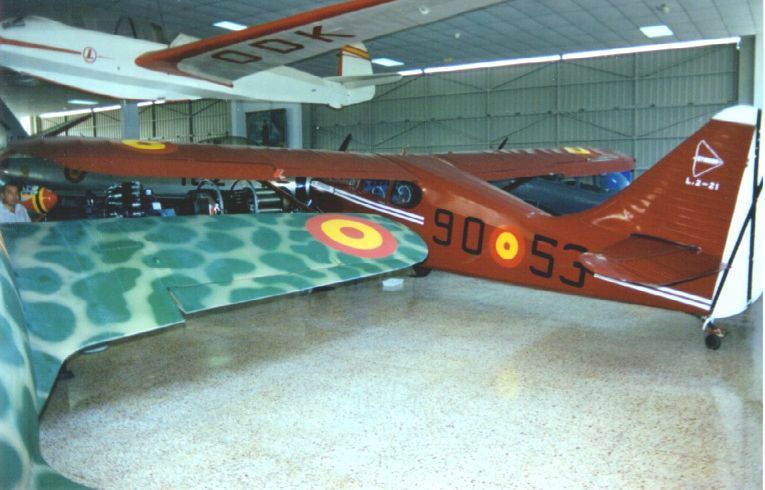 more information from Paco Rivas and Jose Ramon Valero about Spanish Air Force Stinson 108's. Here is a link to Paco Rivas's Aviation homepage. Added 03/02/01, PDF about 10K, last updated 10/10/14. Recently I learned that the French Air Force used the Stinson 108-3 in French Indo China - Vietnam. Alain Flotard provides details. "Andre Bellouard was the pilot and Pierre Rouxel the Mechanics. They are still alive 90 years old and 84. They are very happy of this. 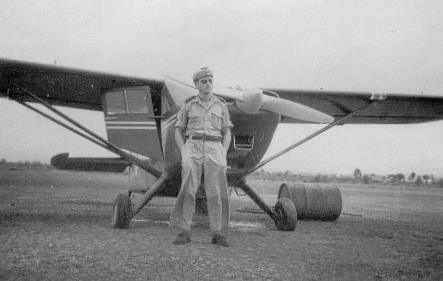 This 108-3, serial number 108-4419, was the plane of "Le haut Commissaire" of the region near Hue. It was the General Lorillot. He used for travelling in all the "Indochine." It flew with original colors Maroon and they put on it the French Cocarde and the insigna of the ELA 52. (Escadrille de liaison aerienne)." Here are some images of Stinson 108-3 sn 108-4419 while flying for France in French Indo China. Here is another head on view of 108-4419 in French Indo China with mechanic Pierre Rouxel standing in front of the airplane. 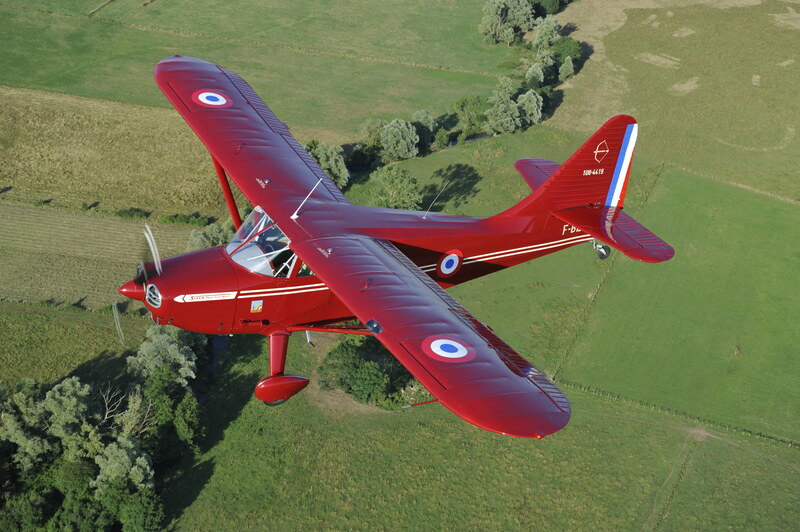 The Stinson flew as part ELA52, Logo of Escadrille de liaison aerienne 52. Images about 103K, 16k and 20K in size. 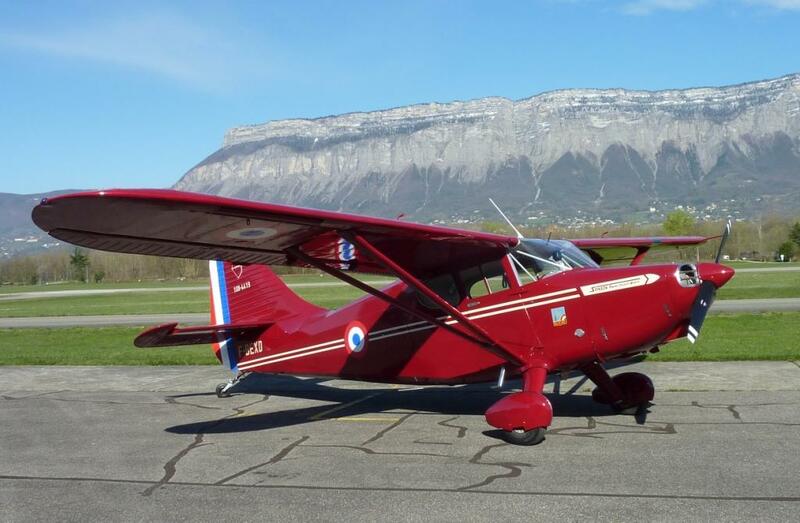 My thanks to Alain Flotard for providing this information about the Stinson 108 in French service. Alain now owns this airplane! Added 11/16/09. UPDATE - Alain Flotard sent this recent image of Stinson 108-3, sn 108-4419, now F-BEXD in the same paint scheme as it flew in Vietnam in 1951. This shows the actual airplane flown by the French Air Force in Indochina (Vietnam) in 1951, now beautifully restored, is flying in France today. Color, about 111K. Added 04/18/10. Modern inflight side view of Stinson 108-3 F-BEXD. Color, about 406K. Added 06/01/14. Modern inflight overhead view of Stinson 108-3 F-BEXD. This is serial number 108-4419, painted in the same scheme as it flew in 1951 in Vietnam (French Indo China then). 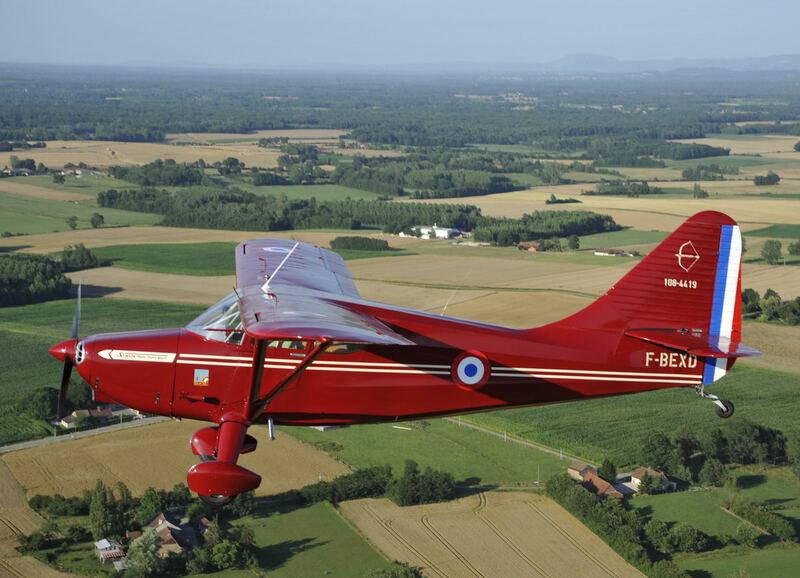 It flew in Vietnam with original colors Maroon and they put on it the French Cocarde and the insigna of the ELA 52 (Escadrille de liaison aerienne). My thanks to Joe Rimensberger for both of these images. 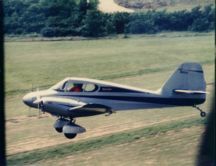 Joe Rimensberger took the photo over Lons-le-Saunier, France; camera plane was Jean-Pierre Schenk's Cessna 180 HB-COE, with thee cabin door removed. Color, about 690K. Added 06/01/14. 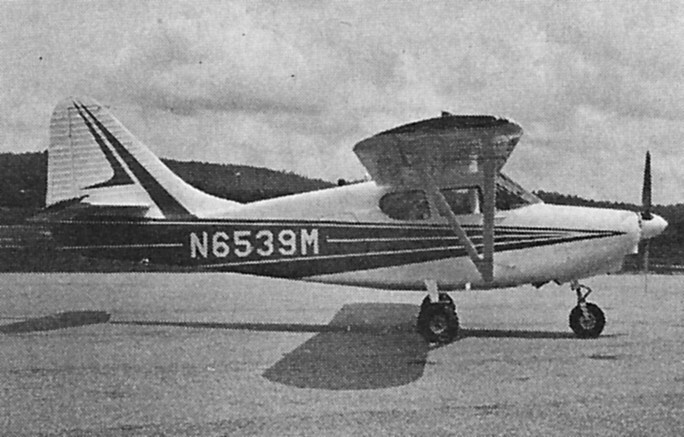 When Piper Aircraft purchased the Stinson Division of Consolidated Aircraft in late 1948, included with the Stinson sale were the drawings for a new twin engine airplane designed by Stinson. 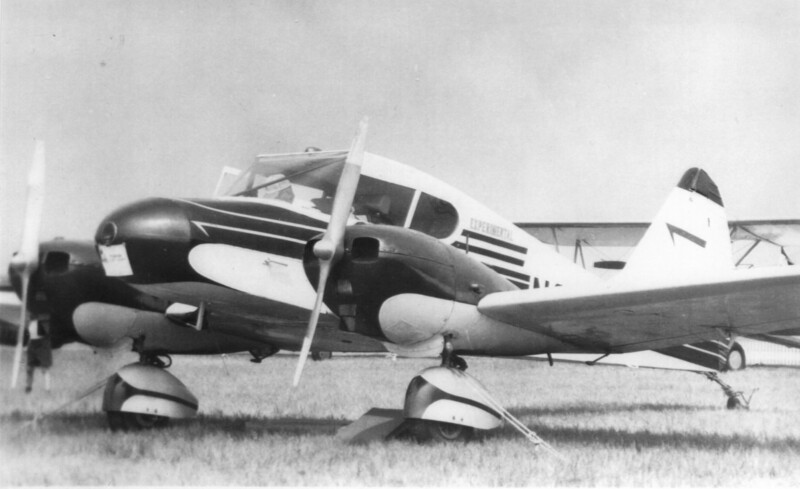 Piper went on to build this airplane, initially naming it the "Twin Stinson." 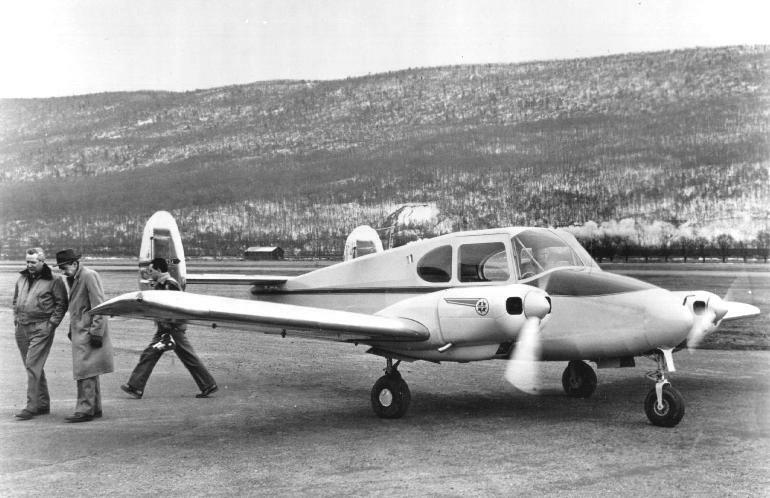 This photograph shows the Prototype Twin Stinson on the ground shortly after its first flight in March 1952. Registered N1953A, with Piper serial number 23-01. 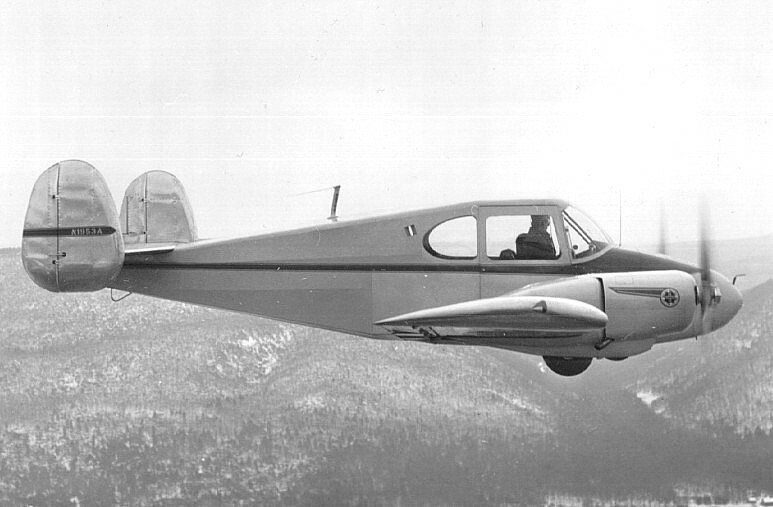 Here is a second photograph of the Prototype Twin Stinson in Flight. This airplane was a true milestone aircraft for Piper. It was the the aircraft which took Piper from the manufacture of tube and fabric "puddle jumpers," into the world of all metal business aircraft. This airplane was later marketed by Piper as the "Apache," first of Piper's American Indian named products. Later it evolved into the definitive Piper Aztec. Added 8/1/00, Last updated 01/18/03. Ground view of the Pierce-Arrow model U-2, registration N6622A, serial number 1. The Pierce-Arrow model U2 is a one off airplane using the fuselage of a Stinson 108, and the wings of a Langley. My thanks to Mike Wilburn for the photo. Photo was taken in 1966, with 90 hp. Franklin engines. Person in the cockpit is John Pierce the guy that mated the Stinson fuselage to the Langley wings. Photo taken at the annual fly in at Fairfax Oklahoma. Later the Franklin engines were replaced by 125 HP Lycoming O-290D engines, and later yet with 150 HP Lycoming O-320 engines. B&W, about 138K, Added 03/24/19. Here is an inflight view of the Langley type airplane whose wing, center section and engines were used along with the Stinson 108 fuselage to create the "Pierce-Arrow" model U-2. Click to view the 1943 Langley Twin 2-4-90. This airplane is the prototype, registration NX29099. Of all wood construction using the "Vidal" process of plastic bonded plywood. Finish on this first example is clear varnish to emphasize its wood consturction. Powered by two Franklin 4AC-199-E3 engines of 90HP each driving fixed pitch propellers. Could seat 4 people, however the useful load was better suited for 2 or 3 people. First example built in 1943, then after WWII ended there were 2 or 3 additional examples manufactured. Langley's built after WWII had the wood covered with fabric for protection from the elements. B&W, about 311K, Added 01/01/16. Here is an in-flight view of the unique Twin Stinson Pierce-Arrow. And a second image of the Pierce-Arrow in formation with a Pitts Special. Recently heard more information about this this airplane, it is now being stripped and inspected. Updated information as of 03/02/01 from owner Jimi Genzling - As it stands right now the Fuselage has completed it's final inspection prior to covering, which will probably start in a couple of week's. It has passed with "Flying" colors. The wing center section is the next project so as to get her back on her own feet. Am in the proccess of building a new wiring harness and completing the interior electrical and rigging prior to covering. Jimi Genzling indicates he would be interested in selling or trading this unique "Twin Stinson" for a high wing project. If you're interested contact the "Desert Eagle" at jimi@hdc-nm.com for more information. Jimi Genzling now has a web page about the unusual "twin Stinson." 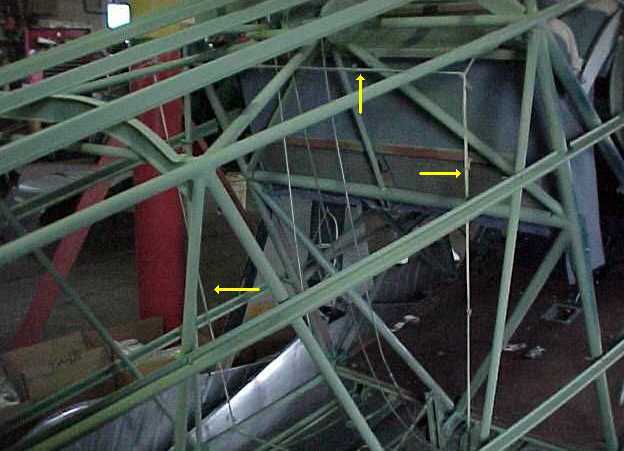 Take a look at the Current State of the Pierce-Arrow Twin Stinson. Plans are to return this airplane to original single engine configuration. Added 6/10/97, Last updated 03/02/01. Read how a Stinson 108 used Electrically Activated Explosive Wing Bolts to remove the wings INFLIGHT! Learn how a Stinson 108 landed safely after shedding both wings at 5,000 feet above the ground. A very unusual Stinson indeed! PDF, about 559K, added 06/04/98, Last updated 10/10/14. Here is an image of the designers Angelo Raiti and Dario Manfredi, with test pilot Tommy Walker, B&W, about 90K. 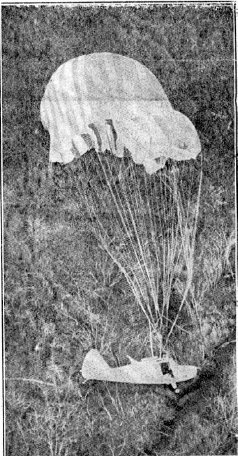 Second image shows the Stinson 108, N39443, serial number 108-13, shortly after the wings have separated and the parachute is deployed , B&W, about 47K, with the third image of the Stinson 108 shortly before touchdown, B&W, about 50K. Possibly most impressive - this airplane was rebuilt and is flying again! UPDATE Feb 2009 - Dario Manfredi, son of co-inventor Manfredi, emailed to say he is currently working on getting the process started by his father certified. Check the Aviation Safety Resources homepage. UPDATE - here is another photo of the aircraft immediately after touching down. This is a United Press International photo, dated November 9, 1967. B&W, about 107K. Last updated 05/13/10. Stinson Stories. Read about interesting stories of the Stinson 108. Converted all the stories to PDF format 11/19/14, page last updated 01/18/98. Stinson Movies This heading is a real odd ball actually. Listed here are the movies I know of which the Stinson 108 has participated. Movies are also included which other Stinson models appear in as well. I suspect there are more movies which I am not aware, and have not listed. Please update me if you know movies I've missed. Rev. 29, PDF format, about 24K, added 08/26/96, last updated 12/04/14. Over the years several people have asked about a Stinson model. Pacific Products Gallery now has available a fine looking Stinson 108-3 model. You can view the model built for Ron Apple on the Pacific Products Gallery of Custom built Civilian Aircraft Homeapge. For more inforamtion you can e-mail Pacific Products Gallery at aircraft@pacprod.com. My thanks to Ron Apple for letting me know about the availability of this model. Added 04/22/00. Another Stinson model source. Joe Dexter emailed me to let me know he ordered a Stinson 108 model from Jeff Bretzer at customaircraftmodels@compuserve.com. Can have your "N" number and custom paint. Ask for the "Continental Airlines price." Added 05/14/00. 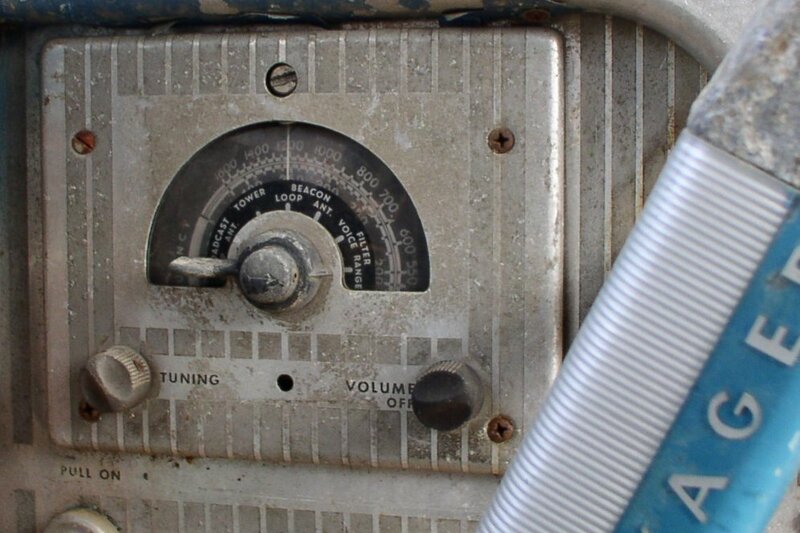 Wendell Hostetler has available plans to build an electric powered radio control Stinson 108. Here is a photo of the completed Hostetler Stinson 108 model. Shown next to the model is Wendell's 14 year old grand daughter for a size comparison. These plans can be purchased from the Hostetler's Plans Homeapge. The plans are for a 26.6% scale model, with a wingspan of 108 inches!! Added 2/14/04, Last updated 06/01/14. If after looking around my homepage and don't find the answer to your question, try the Stinson and Franklin Frequently Asked Questions. PDF, about 17K, revision 2, Last updated 10/17/14. Stinson 108's flown in Airliner Service. Homepage visitor Charles Euripides put forth the suggestion that some Stinson 108's were used in airline service. Since the original suggestion I have learned of four airlines which flew the Stinson 108 in airline service. Rev. D, PDF, about 11K, added 04/07/99, last updated 09/26/14. 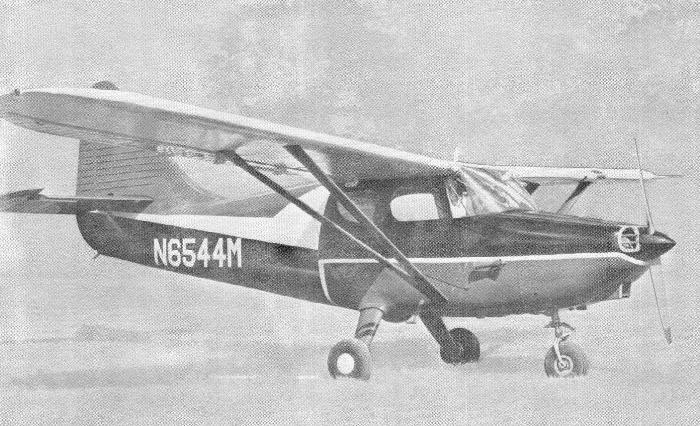 This is an image of a Michigan Central AirLines 1948 Stinson 108-3. 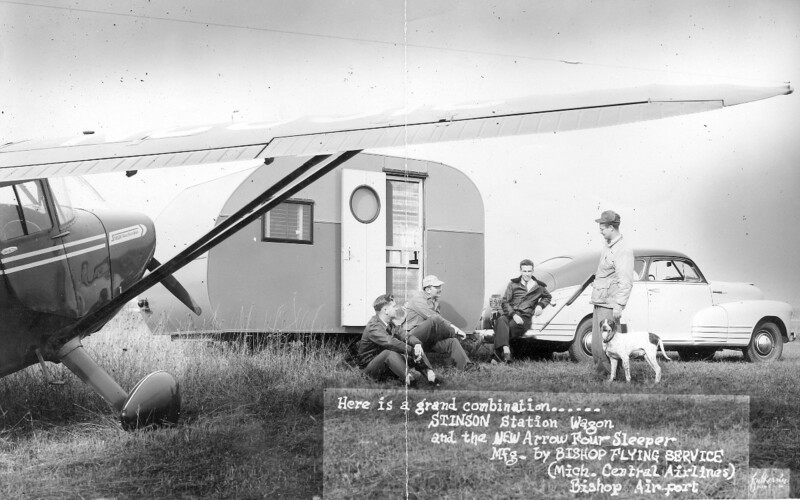 In the background is an Arrow Four camper built by Bishop Flying Service, Bishop Airport, Michigan. The airport is now Bishop Internationatl Airport, Flint, Michigan. My thanks to Betty Jo Takacs Jones for providing this image. Her dad worked in the mobile home industry. B&W, about 210K, added 04/01/18. Here is an image Orcas Air Service flying the 1947 Stinson 108 poster. My thanks to Jon Franklin for providing this image. Color, about 103K, Last updated 02/06/05. Stinson 108 Trivia Question This is a question about the Stinson 108 sent to me by David Talley. PDF, about 26K, image added, question first added 09/05/96, updated 11/19/14. Univair is the Type Certificate holder for the Stinson 108 series airplanes. Univair also has parts manufacturing authority (PMA) for Stinson parts. Many of the parts I used in restoring my own airplane came from Univair. Added 12/30/98, updated 06/06/06. Hangar 9 Aeroworks by John Baker. A lot of information on engine options and Stinson 108 weight. John has an enourmous amount of Stinson information. Due to illness he is selling his Stinson parts, please see John Baker's Stinson Hangar Sale page. John also has information on his Aeronca! Added 12/30/98, updated 03/27/06. International Stinson Club - formerly the SWSC - South West Stinson Club. Valuable source of information about Stinson airplanes and club events. If it has been awhile may I suggest you take a look. Added 09/20/96, Last updated 11/18/18. Franklin Aircraft Engines, Inc., Fort Collins, Colorado. Added 06/17/01, updated 04/17/09. Southern Aero, North Carolina, whose core business is the repair and overhaul of Franklin Engines. Located at Thomasville, NC. Added 11/13/11, updated 10/10/14. Franklin Aerospace is a parts supplier for Franklin engine parts. Located in Thomasville, N.C., across the street from Southern Aero whose business primarily involves Franklin Engine overhauls. Added 10/13/13. Long time International Stinson Club Technical Editor, Joe Dexter, has a new Stinson/FranklinHomepage. Added 07/04/99. Dave Miller has an excellent Stinson site, take a look at Dave Miller's Stinson Homepage. I strongly recommend a look! Added 11/11/03. Julio Natale has a beautiful Stinson 108-1 based in Argentina, take a look at Julio's site featuring LV-NSM Text on the Homepage is in Spanish. Julio has provided an English Translation of the text on his site. Added 04/17/04, Last updated 04/24/04. 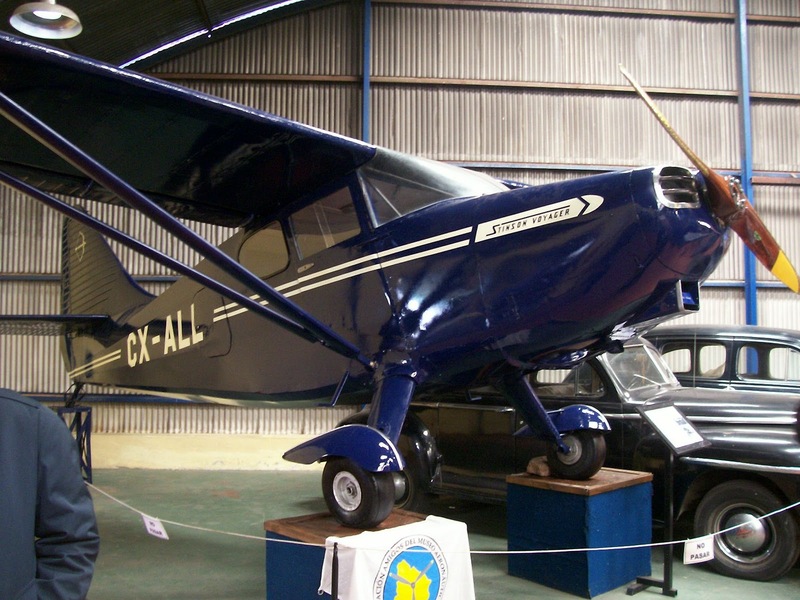 The Museo Aeronáutico of Uruguay has restored Stinson 108-3, registration CX-ALL, serial number 108-5225, which was one of 4 Stinson 108-3's delivered by Stinson to Uruguay on June 29, 1948. Curator Eduardo Luzardo has kept me posted on progress. Here is an image of CX-ALL as received by the Museum. Color, about 251K. After a lot of work by museum volunteers here is how CX-ALL looks after retoration. Well Done!! Color, about 332K. If you are in a position to help financially with a donation to the museum, please contact Eduardo Luzardo at charrua156@hotmail.com. Added 11/02/05, updated 03/23/17. Franklin Parts and Service. Susan Prall is the owner of Franklin Parts. Added 08/12/04. Steve Plourde's Aerial Photography. Steve uses his Stinson 108, serial number 44, N40114, to take aerial photogaphs of the Northern Illinois, Southern Wisconsin area. Added 01/18/03. Kevin Hudson's Stinson 108 page. Jim Gray's homepage features the Stinson L-5 Sentinel. IMPORTANT UPDATE - Jim Gray is in the process of writing a book about the Stinson L-5 Setninel. If you were a L-5 pilot in WWII or Korea, were a Stinson factory employee who worked on the L-5, or can contribute information, particularly vintage photographs, information about Sentinel Aircraft Company, please email Jim Gray at akdhc2pilot@yahoo.com. Added 11/27/00, updated 10/29/09. Franklin Engines by PZL - an AVWEB article. This article details the apparent end of the PZL ownership of Franklin engines. Apparently, from the AVWEB article, PZL no longer builds any piston engines. Details in the link. Added 11/10/98, Last updated 01/06/07. Franklin Aircraft Engines in Grudziadz, Poland. Homepage visitor Dave Watson recently emailed me about this new Franklin aircraft Engines homepage. Last updated 01/06/07. Katherine Stinson: The Flying School girl. Katherine Stinson was sister to Eddie Stinson, founder of Stinson Aircraft. Debra L. Winegarten has written abook about Katherine Stinson. Added 03/26/01. Stinson 108-1 NC8410K, by John Van Horn. 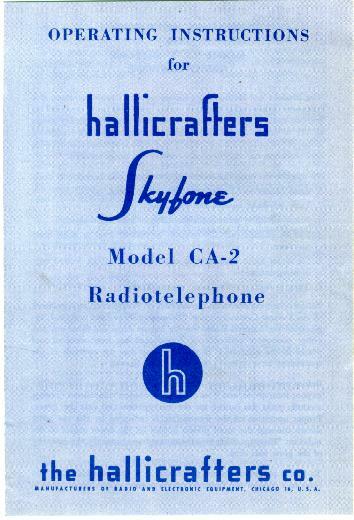 Take a look at the original Hallicrafters CA-2 Skyfone radio! Added 12/23/99. Stinson Factory Photographs circa 1935, by Brian Johannesson. Added 06/21/01. Penn Valley Hobby Center model airplane center. 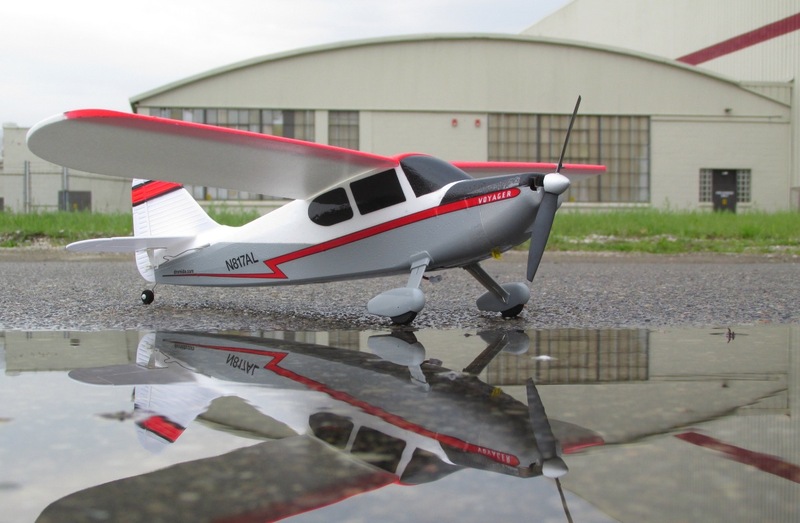 A model of the Stinson HW-75 is available from PVHC. It is the Micro-x FS-702, is a balsa stick model, rubber band power, with a 26" wingspan. PVHC price is $17.36 plus $4.00Shipping/Handling charge per order. Information accurate as of 04/24/99. Tom Schultz's Stinson 108-2 C-FFJT, by Flt Com. Added 06/27/04. The Stinson Reliant, the restoration of 1937 Stinson Reliant SR-9F s/n 5720. Added 06/01/16. Larry Westin's Other Aviation Links Page updated frequently. Locate an "N" number Search for data about the aircraft, owner, engine and other information for United States and some other country's registered aircraft. This is part of Dr. Genther Eichorn'saviation site. There are additional databases to search here. E-mail me at westin@westin553.net - Stinson Info Update with your thoughts and comments.